Lothlorien Cottage is a Visit Wales 4 + Star Graded self -catering holiday home 5 miles from Ammanford 4.9 miles from Pontadawe,30 mins from Swansea and The Gower ,30 minutes from the peak of The Black mountain in the Brecon Beacons National Park., 9 miles from the M4. We have a large family garden with a terrace and brick barbecue and sweeping views over the foothills of the Brecon Beacons. It very comfortably sleeps five people with three bedrooms including a Double Room, a Twin Room and a Single Room. The Family Friendly and Pet Friendly Cottage also benefits from Free Wi-Fi ,Luxuriously soft Egyptian Cotton Towels and bedding and beautiful views. There is also a Babycot available for additional tiny guests. 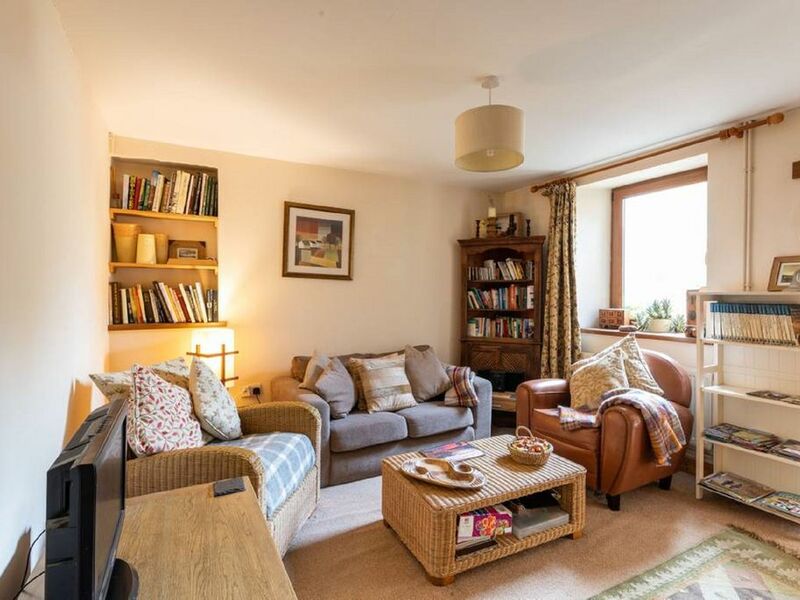 It has an open plan living room with TV,DVD and CD player with a selection of music and a small library of holiday reading and family games. The Kitchen/Dining area is fully equipped with all you need for a home from home including fridge freezer, microwave, oven and hob,washing machine, spindryer.It has a lovely granite floor and views over the hills.There is a round oak dining table for family meal times as well as a small kitchen sofa. The spacious bathroom has a romantic roll top bath with overhead shower and comfy window seat with a mountain view.There is also a towel warmer . .Lothlorien lies in the Foothills of the Brecon Beacons National Park ,close to the Black Mountain , a mere 35 minutes from The Gower Peninsular and its beautiful beaches.It offers Guests a combination of mountain and seaside holiday, with the spectacular Gower and Pembrokeshire beaches and Quaint Brecon Market towns and their eclectic boutique shops. The mystical and romantic Castles of Camarthenshire begin at Castle Cennen, 15 minutes from the cottage. Award winning family adventure parks such as Dan yr Ogof and Folly farm lie close by.. If you love to shop and browse you will love Brecon, Swansea and The Mumbles, Neath or Camarthen and the lovely local craft shops. Food and Craft festivals are a must since the seafood of The Gower and Pembrokeshire Coast is world renowned. You will find lovely local crafts on sale at the markets throughout the area. I am sure you will find a suitable memento of wonderful Wales. My name is Beverley and I am the owner of Lothlorien Cottage. I am very happy to answer any questions you may have about my cottage and the local area. I was born in Scotland but my Grandfather was Welsh and so Wales has always held warm associations for me. I chose this house in this location because I wanted somewhere serene and peaceful with huge skies and a feeling of space. I work in London and so I treasure the simple pleasures amongst the wild birds and plants and the rugged beauty of Wales. I adore the natural world and so it is a delight to watch the wild life in the garden and the changing face of the hillsides. I have a very good friend Caron who lives in the village and she takes care of my cottage and my guests.Her son Callum takes care of my garden and my windowboxes and also my guests. It is very important to me that my guests fully enjoy my home as their home. A house can never have too many happy memories You will find a direct link to my website lothloriencottage.co.uk at the bottom of the amenities section. It is very easy to reserve Lothlorien Cottage. When you choose the pay now button on my advert you will be asked to pay a deposit of 25% of the booking cost. 30 days before arrival you will be sent a payment request for the balance. If you prefer to make a reservation by paypal,I can also send you an invoice for the deposit and balance in the same way. I am very happy to answer any questions you have. Lothlorien is ideally situated to fully experience the magic and the beauty of South and Mid Wales. It lies on the crossroads of four areas of outstanding natural beauty,The Brecon Beacons,The Gower,The Vale of Neath and Camarthenshire. Guests can expect to spend their holiday in a luxuriously comfortable home with everything they need, an ideal base from which to explore the spectacular scenery which surrounds Lothlorien Cottage. The Gower and Pembrokeshire coastline offer beaches that are world renowned and award winning. The Castles of Camarthenshire appeal because of their romantic and fascinating history of the past. The Brecon Beacon mountains are breath-taking,moody and magnificent. Whilst the Vale of Neath offers the glorious Afan Forest and its Waterfalls. There is so much to see that , as we say in Wales, we keep a welcome in the hills awaiting your return. We have a large bathroom with a romantic roll-top bath and a shower which is above the bath.Luxuriously soft Egyptian Cotton towels are provided for guests.There is also a handbasin,a cupboard for your personal toileteries and a selection of bathoils.The bathroom has a view over the Welsh hills. Great location for our needs, of road parking, convenience shop nearby and a pub/food a few metres down the road. Thank you Beverley for letting us use your cottage and thanks to Caron for being there if we needed anything. Highley recommend this property. Thank you very much for your warm review and for being such lovely guests. Delightful. Well equipped and lots of extra thoughtful touches. Comfortable, warm, welcoming, clean. Great welcome pack. Delightful garden. Convenient location. Helpful owners. The only slight drawback is a fairly busy road at the front of the property. However the front is secured by a wall and a gate so is dog and child safe. You and your rescue dogs were delightful guests and I am glad you appreciated our efforts to make guests welcome and "at home".You would be most welcome in the future and I wish you all the very best for the future. We went to celebrate my wife's 70th birthday, the whole family, and all thoroughly enjoyed their stay. We are not the people for strenuous pastimes, but if you do like to hike or bike or run all of your environmental needs are right outside the door. We went to celebrate and chill out. To eat well, the eateries around here sure know how to cook, and to enjoy each others company and get a little R&R. Beverley made arranging this break so easy, have had some real idiots in the past, and Caron was simply great. We can't thank either of them enough. We really do recommend this little bit of heaven with no qualms at all. The Walker & Lord families. it made your holiday a great experience because holidays are times to build great family memories. We were delighted that we gave you "A little bit of Heaven" which is what holidays are for. Thank you once again for being such a delightful family. in lothlorien cottage and verry good and quick contact with the owner of the cottage. Always ready to answer all oure questions. We could'nt wish more ! Thaks to beverley and carron. Thank you very much for your kind appreciation of what we offer in lothlorien cottage. as guests along with your lovely dogs. We had a lovely week in this welcoming cottage. It was clean, comfortable, well-equipped and large enough to comfortably accommodate our family of four. Other than a dishwasher (I'm being lazy! ), the kitchen had everything you'd need if you wanted to eat at home, including a smoothie-maker and slow cooker. If you'd rather not cook, there's a Chinese, Indian and fish and chips within walking distance. There's plenty of books and games to choose from in the evenings, and the free Wi-Fi was very welcome. Linen and towels were provided, and the bathroom was large, with a bath and shower overhead (you have to practise to get the temperature right!). There is a lovely garden to the back - although we didn't quite have garden weather! - and views of the hills behind. Although the cottage is terraced, the walls are very thick (with the added advantage of keeping the heat in), so we didn't hear anything from our neighbours (and hopefully they didn't hear us!). The welcome pack awaiting us in the kitchen was a lovely touch. Although perhaps not situated in the prettiest village, there are some lovely walks from the cottage, and the village is well-equipped with grocery stores and take-aways. It is also a great base from which to explore lots of south Wales, including Dan Yr Ogof caves, Swansea, Carren Cennen castle, Pen Y Fan, the Mumbles, Rhosilli and the rest of the Gower peninsula. All in all, we had a lovely week, and wouldn't hesitate to recommend Lothlorien Cottage. explore the region and I am sorry that the weather wasnt perfect for you that week. Thank you very much for the recommendation. "Lothlorien cottage was immaculate when we arrived and we were amazed at how cosy and comfortable it felt. We loved the general style and really felt at home for the duration of the week. Although situated on the main road, you can hear no car noise when inside. The beds are ever so comfortable. The kitchen is very well stocked with everything you need to cook. We enjoyed playing the board games in the evenings. We took a walk to the hills behind the house (which you can see from the bathroom window upstairs)and it was the most beautiful walk I have ever taken. The beautiful early morning light and quiet, the warmth of the rising sun, the sheep calling out in the distance, everything was absolutely perfect! I would heartily recommend the cottage to anyone wanting to visit South Wales. It is just after the village of Gwaun Cae Gurwen in the direction of Pontardawe. On a map it appears just below Brynamman which is on the Black Mountain on the western edge of the Brecon Beacons National Park. Just less than 5 miles from Ammanford you pass the turnoff (left) to Brynamman and continue along the A474 past CK's stores and the village of Gwaen Cae Gurwen (GCG). Cwmgors is the next village along the A474. Pass Cresci's Cafe on your left and continue past Cwmgors Mini Market on the right (used to be the Spar) and a Cantonese take-away (in what looks like an aeroplane hanger) on the corner of Park Howard Rd. Turn down Park Howard Rd to get to the parking at the back of the cottage. A great base from which to explore the magnificent Welsh coastline, with fabulous sandy beaches to the south, Swansea Bay and the Mumbles and the Gower Peninsula - designated Britain’s first area of outstanding natural beauty in 1957 with its secluded coves, sandy beaches, surfing heaven and ruined castles, and the Worms Head and Rhossili (The breathtaking view of Rhossili Beach made it to number 11 in the Jacobs Creek competition '50 Best Views in the World' ) or enjoy the 22 km Millennium Cycle Path along coast. The cottage is on the edge of the Fforest Fawr Geopark, with some of the most stunning natural and man-made attractions in Wales, including the breathtaking Carreg Cennen Castle, The National Showcaves Centre for Wales, Craig-y-nos Country Park, the wilderness area of the Black Mountain, Pen y Fan (the highest mountain in southern Britain), and the Brecon Mountain Railway. The National Show Caves Centre, has caves extending 17 km into the Black Mountain - recently voted Britain's finest Natural Wonder. There is also one of the largest dinosaur parks in the world here. You may consider taking a trip in a hot air balloon from one of the two companies within 10 miles of the cottage. Waterbabies will love swimming from one of the wonderful Welsh beaches (or enjoy the open air swimming pool at Brynamman which has the last lido in South West Wales), and if there is any energy remaining , then go mountainbiking along one of the 16 breathtaking cross country trails in the Brecons or just chill out and enjoy wonderful Wales.